It says a lot about a hotel when the Queen Mother would rather settle down for Afternoon Tea here than at the Palace. 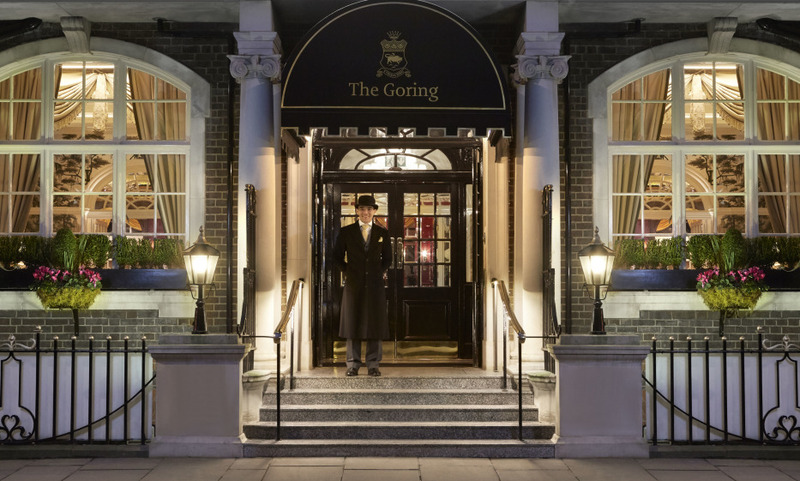 Or that it’s the only hotel in the world with the Queen’s Royal Warrant, and the Duchess of Cambridge calmed her frayed nerves with a stay in its plush Royal Suite ahead of her wedding … Located just opposite Buckingham Palace, The Goring, will forever be connected to British Royalty. For generations its staff have remained tight lipped about the coming and goings of the monarchy within the hotel’s halls… and what halls they are too. A constellation of the country’s best designers including, Russell Sage and David Linley ( nephew to the Queen) collaborated to revamp this classic and they’ve left it looking as British as ever: Elegant, quirky, and as comfy as an evening on the couch with a warm cup of tea… The restaurant’s recent inclusion in the Michelin-star family confirms what the Queen Mother knew all along…that the eggs drumkilbo served here are the best in the realm. Quintessentially English atmosphere and tradition. The privately own garden and veranda. The great sheep in each room. This hotel and its staff are amazing. The location and the setting are unique in London; in fact, the hotel has the second largest private garden in London. The first is owned by Buckingham Palace. The staff is exceptional. Every person I met deserves the highest praise. I definitely hope to return!! Thank you. I love the Goring. A luxurious but very personalized hotel. I would travel to London just to stay there. Every member of the staff is amazing! Absolutely lovely. Staff were warm and welcoming. Wonderful atmosphere. Would definitely return. The Goring is lovely. The food at both meals was exceptional, as was the service. The sommelier was knowledgeable without being intrusive while the rest of the staff seemed happy and enthusiastic in what they were doing. The bar manager is a bit of a star, finding appropriate tables and greeting guests with calmness and care. The whole experience was a real pleasure. Absolutely one of the best Hotels my wife and I have stayed at. Goring Family influence definitely a factor. Would go to the Hotel again when in London. Compliments to the employees and the management! Hotel is wonderful ! True British class without being stuffy. Most impressed with the friendliness and efficiency of the staff. They were the true value of this Hotel. Absolutely perfect, the very definition of a five star, but with the advantage of offering very personalized service. The staff are very nice and great attention detail was put during our stay as we were there celebrating our wedding anniversary! Thank you all!! A very good hotel with quality service and a superb room. It was a perfect experience. At first we weren’t upgraded but one call to Grand Luxury Hotels solved that and we received an immediate room upgrade, a gift in the room and even better service from the staff. Everything was perfect, so much that I will book, through you, next September. Just one downside: no magnifying mirror in the bathroom, and given the depth of the sink… we’re far from the wall mirror in front of us. But that aside: happiness! The Goring is my favorite hotel in the world. I used to stay there frequently on business, but have not been back in about 5 years. It meant so much to have people remember me -- Peter is my favorite doorman and he gave me a big hug and a welcome back. The service at The Goring is exceptional. For me it is like coming home !